The head of the mandible fits neatly into a hollow situated on the underside of the temporal bone of the skull at the joint. 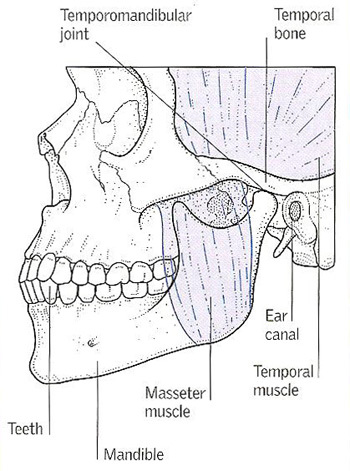 Section through the temporomandibular joint. The temporomandibular joint is the joint between the head of the mandible (lower jaw bone) and the temporal bone of the skull. It is a synovial joint; and its cavity is separated into an upper and a lower part by an articular disk. 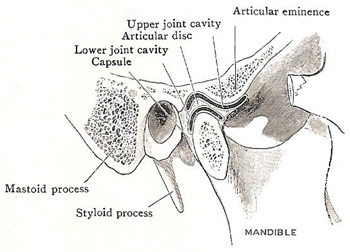 The capsular ligament is attached superiorly to the temporal bone around the margins of the articular fossa and eminence, and inferiorly to the neck of the mandible. Its lateral part is thickened to form the temporomandibular ligament. This is a triangular band attached by its base to the zygomatic bone and the tubercle of the root of the zygomatic bone, and by its apex to the lateral side of the neck of the mandible. The articular disk is an oval plate of fibrocartilage whose periphery is fused with the capsular ligament, and it therefore divides the joint cavity completely into an upper and a lower compartment. The synovial membrane is in two separate parts. It lines the capsular ligament around each chamber, and is reflected on to the disk to cover its peripheral part. The only ligaments proper to the joint are the capsular and temporomandibular. Two other ligaments – the sphenomandibular and the stylomandibular – are described with the joint because they connect the mandible with the cranium; but they are not closely related to the joint, and add little to its strength. For that matter, the joint does not rely on any of its ligaments; it is chiefly the muscles of mastication that keep the mandible in its place. Pain and other symptoms affecting the head, jaw, and face are thought to occur when the temporomandibular joints and the muscles and ligaments attached to them do not work together properly. A common cause of temporomandibular joint dysfunction is spasm of the chewing muscles, often caused by clenching or grinding the teeth as a result of emotional tension. Malocclusion (an incorrect bite) may be a contributing factor because it places additional stress on the muscles. Temporomandibular joint problems may also be caused by jaw, head, or neck injuries. In rare cases, osteoarthritis may be the cause. Common symptoms include headaches, tenderness of the jaw muscles, and an aching facial pain, especially in or around the ear. There may also be difficulty in opening the mouth, locking of the jaws, clicking noises as the mouth is closed or opened, or pain caused by opening the mouth wide or chewing. In most cases, treatment involves eliminating muscle spasm and relieving pain with analgesic drugs. In some cases, injections of corticosteroid drugs into the joint may be given. The bite may need to be adjusted by the use of an orthodontic appliance. In severe cases, surgery on one or both temporomandibular joints may be needed.